The LA Street Food Festival!! My new favorite time of the year and a place where people like me gather and enjoy weird and decadent dishes from different parts of the world. As mentioned in Ashley's review right before mine, she introduced to you what the event was all about and the fine details about what we encountered. With that being said, I am just going to jump right into the food! Chilled shrimp ceviche from Coni's Seafood . A good appetizer, right? So also a good way to start off the food festival especially in the thick 90 degree weather we were walking around in. It was refreshing, spicy and tangy with very few components. The simplicity of just the shrimp, tomato, onion and cucumber allowed the flavors to mesh well and also not to be too off-putting by being too fancy. I don't necessarily like tomatoes and less so in their chunky repulsive form but with the added chip to act as a crunchy spoon, it wasn't an issue. However, LOOK AT THE ONE CHIP THEY GAVE ME FOR ALL THAT CEVICHE. That is some unacceptable nonsense. I had to drink the rest of it and there was a lot of unnecessary slurping. Keeping to the Mexican theme, my next course was a shrimp taco from Mariscos Jalisco that was delicately rolled into a puffy, crispy deep fried tortilla. It was wrapped like a taquito but the shell was much lighter and flakier, which made it super easy to handle and not get precious food particles all over my dress. 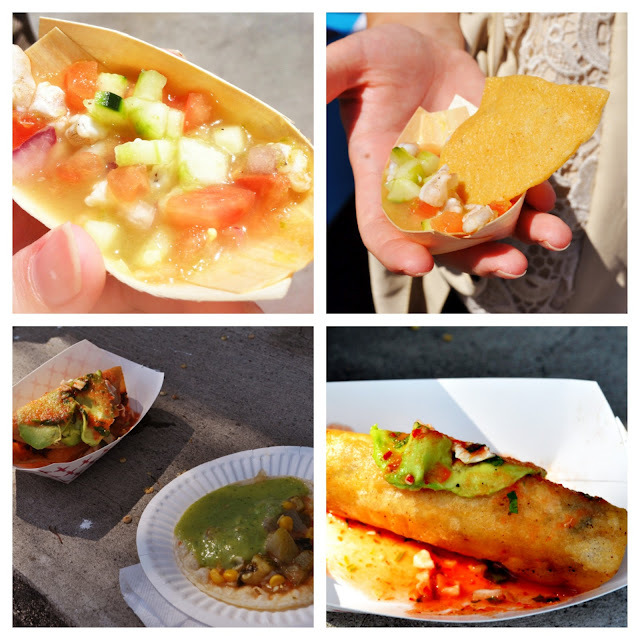 It was topped with fresh slices of avocado and a sauce that absorbed well into the fried tortilla. In the filling I could only detect shrimp and cheese, there was no real taste of any vegetables or peppers on the inside but the crunch combined with the gooey cheese made it a worthwhile dish. Now that green-sauced taco featured next to my decadent shrimp taco was from Antojitos Carmen and was nothing to get excited about. They claimed it was their "vegetarian" version but it was really just some sauteed onions and corn. I felt like their vegetarian customers were not their priority so they don't really deserve a thorough review from me. 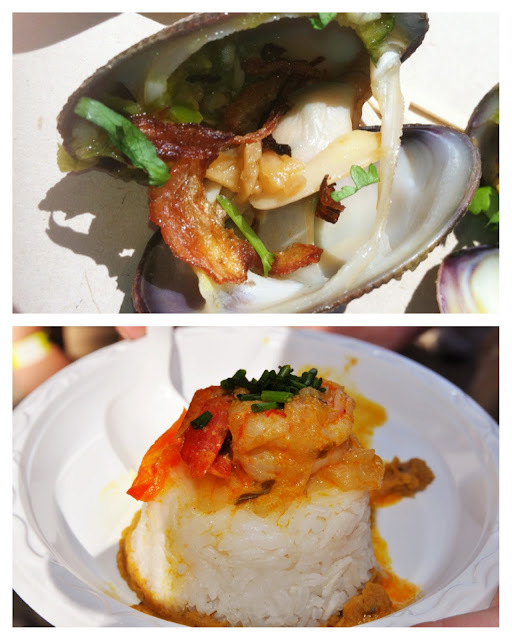 The only dish I had seconds of were the Thai spiced clams from Ayara Thai, in the top part of the above photo. Clams can be highly annoying with being so tedious in cleaning, shucking and then getting a tiny amount of actual meat out of them. If I'm not doing the work, however, then I'm more than happy to eat a thousand of them. They presented their clams so they would be showcasing their orange hued meat with some vibrant cilantro and yet they only gave me two. Surprisingly, they weren't too spicy unless you swallowed too fast then you will inevitably burn a hole into your throat but if you know how to chew like a normal human (apparently I'm incapable of this) then you'll be fine. How do you really explain Thai spice? I don't really know what spices are used in this mixture but I'm assuming chile powder or cayenne. Either way the cilantro has a refreshing, cooling affect and they were cooked to absolute perfection. I almost didn't throw away the shells because they were so round and cute but unless I'm making some hippie-looking necklace, I don't need to be collecting food trash. The shrimp made with coconut milk from Sabor da Bahia was a good idea and tasted fine but it wasn't too memorable.One of the chefs stuck the rice tower to the plate with what I think was a thin layer of poorly salted re-fried beans. The one lonely shrimp atop the bed of white rice was cooked nicely and garnished with thin, warm coconut milk. The flavors weren't loud or overbearing and the sauce was crucial to get through the tower of unseasoned sticky rice. I could have used more sauce and a salt shaker, also some avocado would have made a vast difference in this dish. These chefs showed up the event with potential for a flavorful sample of Brazilian food but didn't execute an outstanding dish like some of the other meals I encountered that day. 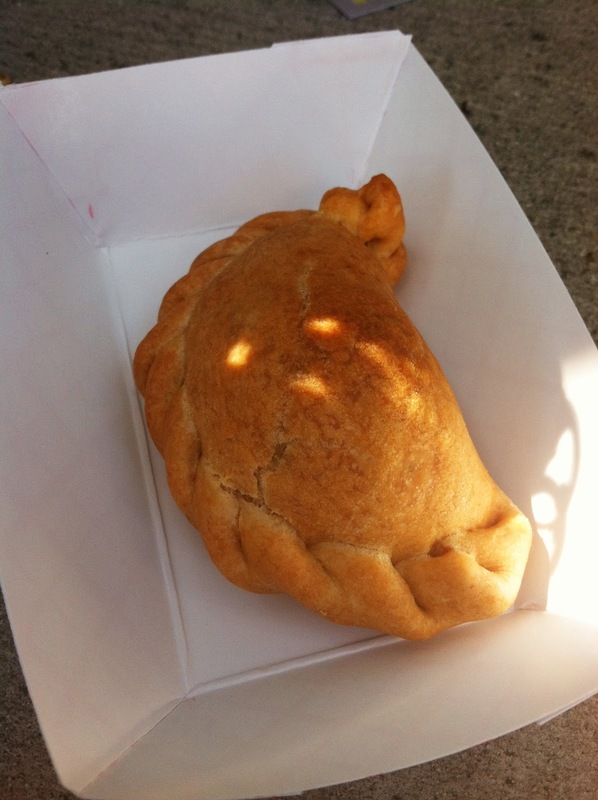 Here is a lonely picture of one of the worst empanadas I've ever tasted and it deserves to be ostracized. This was a potato empanada from World Empanadas and was among one of two vegetarian options, the other being spinach (they also offered cricket filled empanadas). The first bite of this was so dry that it sucked the saliva from my mouth to compensate for it's extreme lack of moisture. There was no seasoning on the potato inside the the dry empanada dough, it was merely an unseasoned piece of hash brown stuffed inside a crumbly piece of cardboard. Granted, they did offer salsa at their booth but I shouldn't have to rely on salsa to save the entire dish from being a disaster. I wasted precious calories on this and I want them back!